Yongki, an endangered Sumatran elephant that was famous in Indonesia for helping protect other endangered habitats, was found dead recently in Bukit Barisan Selatan National Park on the island of Sumatra, the apparent target of poachers, according to a statement released by the park. According to Agence France-Presse (via Rappler), Yongki was found with his three-foot tusks crudely removed "leaving just bloody stumps." He was killed while chained up because his keepers did not want him wandering out of his camp. According to the World Wide Fund for Nature, Sumatran elephants are a critically endangered species with a population hovering between 2,400-2,800. The animals' ivory is worth high-dollar amounts on the black market, especially in China, AFP reports. Officials at Bukit Barisan Selatan National Park have not yet determined how Yongki, aged 35 years, had died. Poisoning is a common method. 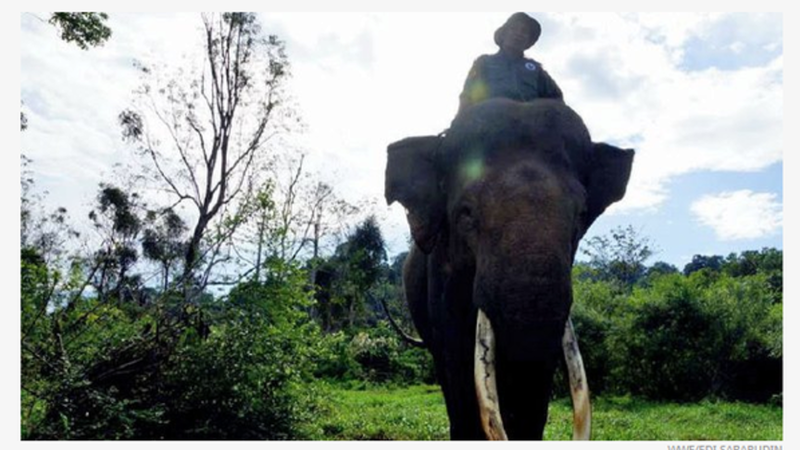 "We are mourning the loss of an elephant who has been helping us in handling conflicts and helping forest rangers patrol the forest, and he was a good elephant," Nazaruddin, who goes by one name, told AFP. The elephant both helped with anti-poaching patrols and calmed wild elephants who were threatening to stampede local villages. The news of the elephant's death has prompted outcry on social media, mostly under the hashtag #RIPYongki. Most of the tweets are written in Indonesian; it hasn't really made many waves in the English-speaking world thus far, especially when compared to the hunting and killing of Cecil the Lion by a Minnesota dentist over the summer. (WARNING: A graphic image of a killed elephant follows). The news of Yongki's murder comes almost two months to the day that Cecil was killed and we all know how that played out. Cecil's death inspired outrage and spurred some changes as well; will Yongki's death do the same?